That is our family's mantra. The good news is that we work very hard. Too hard. So we have to play just as hard. The bad news is that it is hard to play hard. There are so many limitations to what we can do and I am taking steps to change that. Too hard to play when you can't even move. His wheelchair actually broke trying to push him through this. I wanted to share with you a project that I am doing that will allow all children to play hard. I am designing, fundraising and constructing the only fully accessible, barrier-free playground to be constructed at a school in our county. It is also the only accessible playground in the western half of our large county. There is no such thing as a playground for handicap children and a playground for typical children. Either a playground is fun for everyone or it is not. This will be a playground that is fun for everyone, where challenges and limitations, created by disabilities, will be forgotten. This playground will provide inclusive play where dignity, respect and appreciation of differences will be promoted among typical peers. Elements in this playground have been carefully considered to allow meaningful and appropriate play for every child, regardless of their disability -- ramps and play surfacing for easy wheelchair and gait trainer access, quiet enclosed spaces for those children easily overstimulated and need their calming area, tactile and musical spaces for those that have visual impairments that are easy to manipulate by even the most challenged of fine motor skills, shady spaces to not aggravate kids with seizure disorders, rocking and motion for the sensory input many kids seek. Most importantly, it is fun for everyone and typical kids will enjoy the unique, nontraditional elements this playground includes. It has been reviewed by therapists, special education teachers and special needs moms and has been given the smile of approval by all. ﻿The typical playground that our school was going to build was budgeted for $30,000. Our school is a magnet school for a large special education population (approximately 10% of our student body). Because of that I stepped in and suggested that perhaps they should consider an accessible playground where every student could play. They let me run with it and I did. To make an appropriate, accessible (and totally cool) playground will cost $135,000. I promised I would make up the difference through fundraising and grants. I am proud to say that I am half way to the goal. Please visit our website to see more about this project and how you can make a tax-deductible donation online through paypal and change the lives of hundreds of children with special needs and allow their peers an opportunity to learn a lesson in humanity that is promoted through inclusive play. I hope to reach our fundraising goal by July 15th. Thank you, friends and family, for your continued support. Bridger's name is not by coincidence. He was given a blessing as an infant that he would be one "who would build bridges". 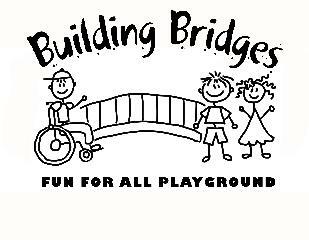 This is the largest initiative thus far in my campaign called "Building Bridges" -- with the mission of helping children with special needs and their families enjoy lives of inclusion within their community. Bridger has touched the lives of so many and has proven already in his few short years, indeed, to be a Bridge Builder.